Generally, the ETB is a set of UI elements that are built as a tree where each element is anchored to its parent element. 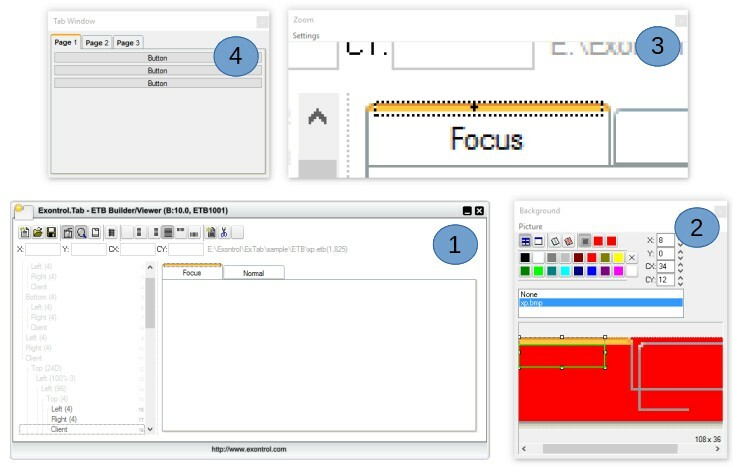 The ETB object includes two inner objects, Focus and Normal, that defines the visual aspect of the focused / normal page of a TAB control. A TAB control is analogous to the dividers in a notebook or the labels in a file cabinet. By using a tab control, an application can define multiple pages for the same area of a form or dialog box. Each page consists of a certain type of information or a group of controls that the application displays when the user selects the corresponding tab. The skin method, in it's simplest form, uses a single graphic file assigned to the client area of the painting object. By using a collection of objects laid over the graphic, it is possible to define which sections of the graphic will be used as borders, corners and other possible elements, fixing them to their proper position regardless of the size of the painting object. 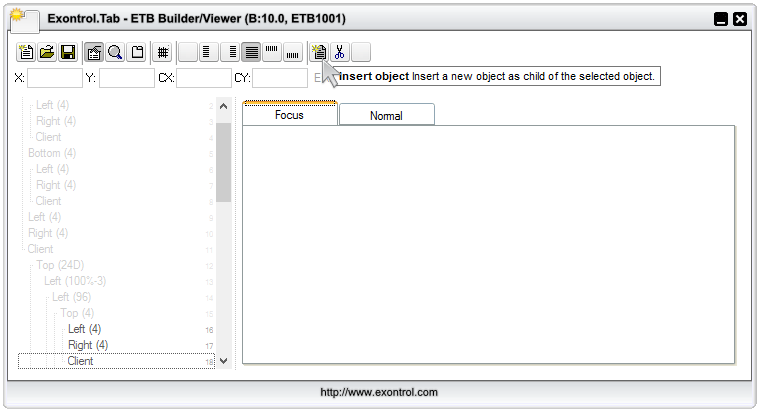 Currently, the ExETB builder may show one or more panels, such as Designer, Background, Zoom and Test. The Designer is the main panel of the tool that displays elements that composes the ETB file/object. In the designer, you can add/remove/update any element in the ETB composition. By default, it defines the Focus and Normal pages. The Background panel displays the list of pictures / solid colors that may be applied to any element in the ETB composition. The Zoom panel can be used for zooming/shrinking a portion of your screen. The Test windows displays the current ETB to a TAB control, and it is visible only if the Test button is clicked.